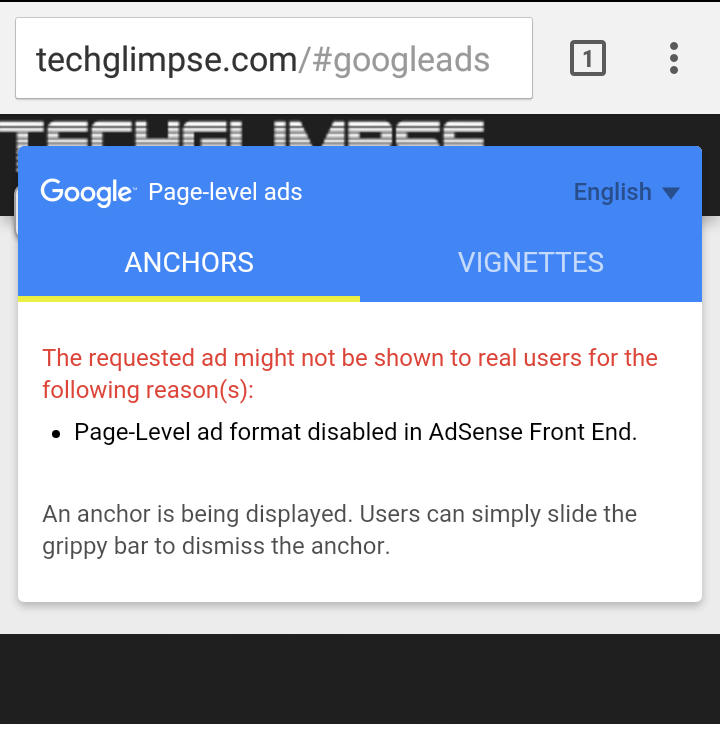 How to fix Page-Level ad format disabled in Adsense Front End? Recently, I received an optimization tip from Google Adsense which suggested to try out the new Page-Level ad formats for mobile devices. The Page-Level ad formats are optimized to only appear when they’ll perform well on your website and seems to provide a good user experience (well, I just started to try out and it would take some time before I can show thumbs up for these new ad formats). It consists of two formats – one is the Anchor/Overlay ad, that stays at the edge of the device screen and can be easily dismissed and other one is the vignette ads, which is a full-screen ad between the page loads and can be dismissed with a tap. Setting up these ads are quite easy and can be previewed by adding “#googleads” in the website URL. 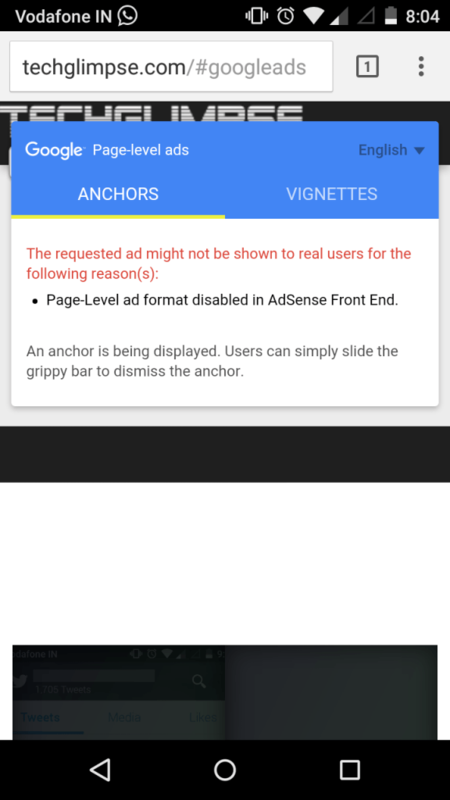 However, I got this error Page-Level ad format disable in Adsense Front End when the website was loaded with “#googleads” (for e.g techglimpse.com/#googleads). Check if you have enabled the new Page-Level ad formats. Login to your Adsense account and click My ads > Page-level ads. Confirm that the ad formats are enabled. Reload the page again with “#googleads” in the URL. Do you still see the error? You may need to delete the browser cache and try reloading the page. In Chrome, Mozilla Firefox and Internet Explorer hit Shift + Ctrl + Del to clear the cache. You must be using desktop browser. Page-level ads may not work on desktops and you should try testing it on mobile devices. Did you place the ad code in <head> tag? If not, place the ad code within <head> tag and try testing it again. Probably, your device is changed from portrait to landscape mode. In most cases, the issue should be solved when your device is back to portrait mode. Check if you have enabled server side caching for your website. For example, you may need to clear the cache stored by the WordPress plugins such as Total cache. Probably, you had just enabled the Page-Level ad formats and need to wait for while until it works on your website. Shall we play a guess game? Guess, how will you prevent someone from using your Adsense code on their website? Thanks, now working on my site! I am using insert header and footer plugin on my WP based website, now it is showing ad below the site title.. is it normal? I not solve this problem, and i have the same problem , when i try #googleads on device mobile, and i have enable all , why not solve problem?